As much as I dislike players going over easily, I'd have to say that Rafael Marquez was simply outfoxed by the smarter, quicker footballer there. He was labouring as the game wore on, and Arjen Robben - while making a meal of the challenge - was definitely fouled. Mexico was robbed. End of story. 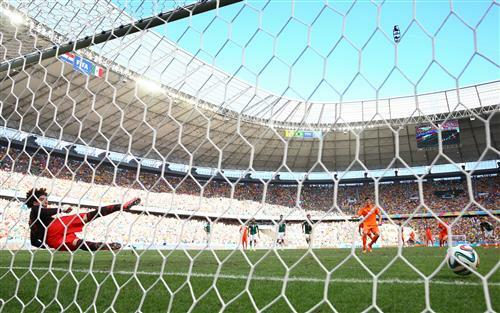 Mexico fans should be more upset that their attackers couldn't score more than 1 goal in the 1st half. They had the chances. If they had taken them, the penalty might not have been decisive. absolutely no penalty. what about the kick to head in first half close to goal? Apart from falling all over the place..robben had a splendid second half. Lets say that penalty was a no call. I still don't see how you can say Netherlands didn't deserve to win. They dominated the 2nd half and scored a great equalizer. Why not some applause for Tom who managed to predict the correct score right from the start? Gw, I was hastily backtracking from that prediction at around 87 minutes in! Got to say that I really like listening to Roberto Martinez talk about football. Can see why it seems like people like playing for him. How can anyone say Holland aren't deserving winners? In the first half they conserved energy, absorbing Mexican pressure in the sweltering conditions. They conceded a spectacular goal and then attacked for the entire second half. Their two late goals were a victory for discipline and tactics, where as it appeared Mexico were the side who lacked fitness and cool heads when it mattered most. Yes, Tom - great prediction. I had the same prediction as well! Golf clap for Tom....from the wag.. Interesting that Robben is to blame for going down when there's clear contact, while Marquez is apparently not to blame for making that contact in the first place. Copenhagen, good call - the fact that it was Robben going down has effectively absolved Marquez of all blame, when i fact he had no need to make the challenge, which was a lazy, tired attempt that simply wasn't needed. I do hate robben for his reputation of a diver...but i am surprised no one is talking about the definite penalty shout in the first half. Robben was clearly kicked twice in the area..! That victory was so United and Fergie Esque. I Can't wait for the United - LVG era to begin. Any ideas why Van Persie was not his usual self today? RVP may not have been fully fit today. Lets also not forget though, he was sensationally denied by Ochoa. Not sure how to feel. Robben was fouled in penalty area in the first half but not called. Then got the call at end of game when was not a foul. Do the two equal out?? Robben will move to Florida..wear a Plaid leisure suit with some white loafers when he retires..
@Andy and others: you think people in the BR (and elsewhere) are rational and fair in their conversation?! We all spout forth our biases with conviction! he probably already does, fingerwagon. The two calls shouldn't equal out because there's 45 minutes to make up for the first call. No time to come back from the second. One bad call shouldn't lead to another. JC, good call - however minimal the contact, if you make the challenge then you give the officials a decision to make. If Marquez had shepherded him away from goal, Mexico would probably be playing extra time right now. Robben should have drawn the penalty at the close of the first half. No way the ref could let another one go. Van Gaal with the masterstroke bringing on Huntelaar for Sneijder. Huntelaar finishes with an assist and the match winning goal. Huntelaar came on for RVP..
Is Fergie time now Van Gaal time? Klass Jan Huntelaar scores the winner.